Filters are characterized and named by their ability to transmit and block light of different wavelength ranges. This section discusses the spectral profiles for different types of filters and highlights how their properties distinguish them from one another. Figure 10 illustrates transmission characteristics. Bandpass filters are designed to transmit a specific range of wavelengths and block light on either side of that range. These filters are denoted by their center wavelength and bandwidth. The center wavelength (CWL) is the arithmetic mean of the wavelengths at 50% of peak transmission. The full width at half maximum (FWHM) is the bandwidth at 50% of peak transmission. Commonly called a grey filter, a neutral density (ND) filter blocks all wavelengths of light evenly. For example, a particular ND filter might transmit 2% of the entire visible spectrum, while another (Figure 11) might transmit 50% of light in the same range. ND filters are typically intended for a specific range and do tend to fall off on either end of that range, therefore it is important to specify your application when ordering. 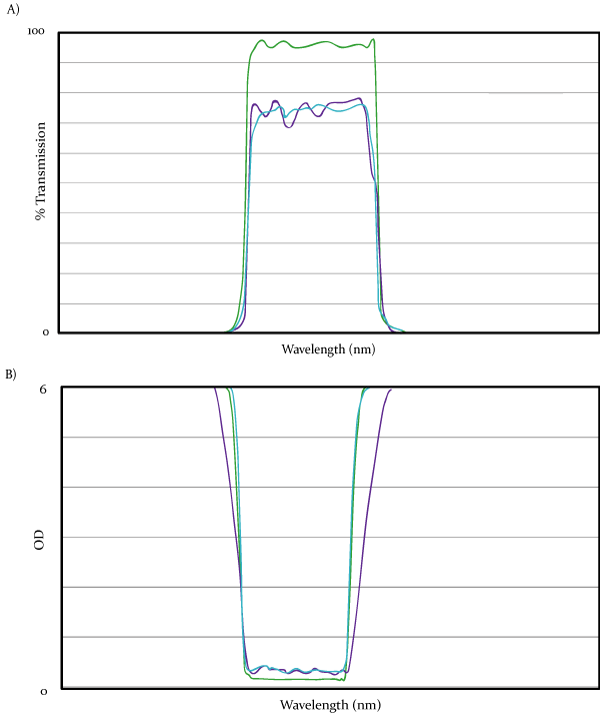 The major difference between the D-type and HQ-type filters are the slopes of the bandpass’ blocking cut-ons and cut-offs. The D-filters have a shallower slope to their cut-on and –offs, whereas the HQ-filters’ are steeper. In other words, it takes less of the spectrum to go from low blocking to high blocking with the HQ designs. This allows us to widen the bandpass of the HQ-filters while moving the excitation and emission bandpass closer together in “spectral space”. 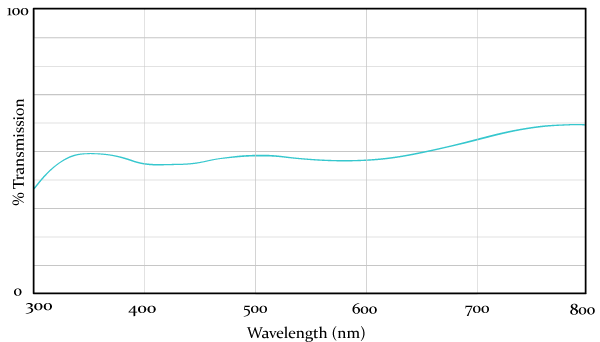 The ET-filters possess similar blocking properties to the HQ-filters, though the ET-filters’ average transmission across the bandpass is 95-98% (Figure 12). It is important to note the lack of dependency between %T and blocking. It is impossible to interpret blocking levels or steepness from a transmission curve due in part to the filter's absorbancy. This is why both the %T and OD diagrams are shown when expressing the spectral characteristics of a particular filter. Figure 17: Differences between D, HQ and ET-style filters. 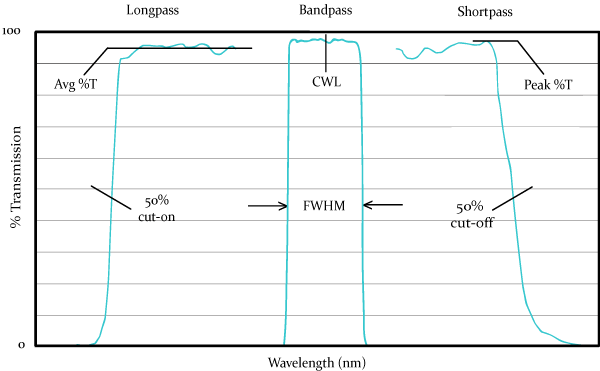 A) Typical transmission for D480/40x, HQ480/40x, ET480/40x, B) Typical out-of-band blocking for same.